BlackHawk Announces NEW Talon 190 Paramotor! World’s Longest Paramotor Race 2015! Winners Announced! BlackHawk’s Fall Fly In a TOTAL Success in 2015! BlackHawk Now Offers FINANCING Through Wells Fargo! BlackHawk heads to the jungles of Costa Rica! Oshkosh Airventure a Total Success! What is Included in Our Paramotor Package? BlackHawk Paramotors Attending the Largest Airshow in the World! Home / Latest News / Lightest Paramotor in The Powered Paragliding Industry! Lightest Paramotor in The Powered Paragliding Industry! The NEW Kestrel Line of Powered Paragliding frames are a global hit! BlackHawk Paramotors USA has become the leader of innovation in the industry. Our team expert engineers and designers stay on top of any technological breakthroughs applying to the sport. The BlackHawk Kestrels are a shining example of just that. The Kestrel frame weighs in at only 8.5 lbs! This unbelievably durable frame has become the most desired among our customers. Performance and safety were our key focuses in producing this new revolutionary product. We like our customers to have choices, allowing them to customize their gear to fit their specific needs. That’s why we came out with the Kestrel Standard and the Kestrel Pro. Our Kestrel Standard was designed with high hang-points and rugged J-bars. The Kestrel Standard provides pilots with unmatched stability in flight, and super-easy launch characteristics. Our Kestrel Pro series was designed with the most responsive weight-shift feature we have ever added to a machine. This gives the pilot an almost “free flight” feel and control. You can get the Kestrel frames on our ever-popular BlackHawk 90, 125, and Talon 175 Paramotors. 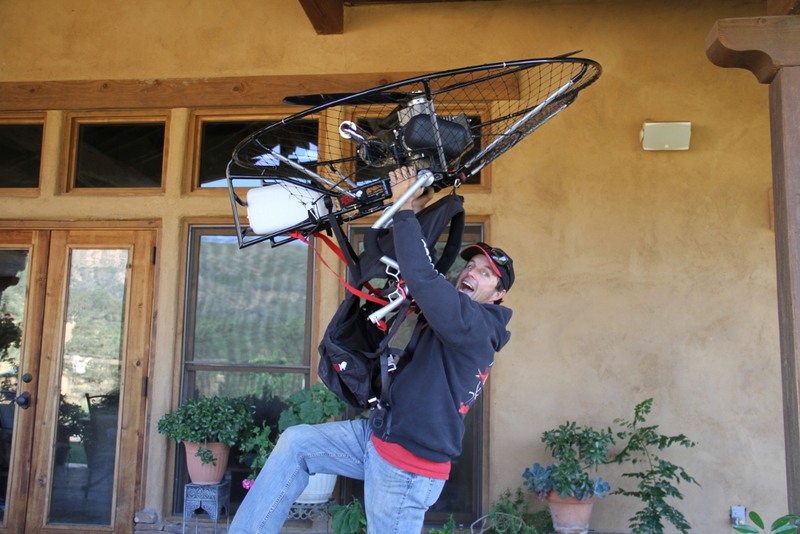 Our entire Kestrel 90 Paramotor weighs in at 45 lbs! All the Kestrel units are now under 50 lbs total weight. In the past, many of our customers with physical or age limitations would chose a LowBoy Quad for flight. Now, many of the same customers can easily foot-launch these new machines. One customer stated “I’m only 33 and have bulged and degenerative disks in my back from running Karate schools over the years. I was disappointed that I was limited to quad flight. The only machine out there I could foot-launch was the Mini Plane, and I did not feel safe on that thing. BlackHawk’s Kestrels are so much stronger than a Mini Plane, and I’m not afraid of putting my entire hand through the netting. The first time I picked up the Kestrel on my back, I thought ‘oh yeah – I can totally do this!’ Thanks guys!” Only the lightest, strongest, and highest-quality materials are used in the construction of any products we produce. Previous Paragliding With The Velocity Elektra in Pacifica California! Next BlackHawk’s NEW AirMax 220 is a Versatile Powerhouse! Flying Cars? The Paramotor is HERE! WEBSITE DISCLAIMER: Powered Paragliding, as with any form of flight, carries potential risks including personal injury, property damage, or death. This sport can be as safe or as dangerous as you choose to make it. All Equipment is not intended for acrobatic or competitive use, in any way, shape or form. Do not purchase equipment or participate in this sport unless you are prepared to personally assume ALL risks. We require you receive professional training from a quallified instructor before you attempt to assemble, start, use or fly your Paramotor / Powered Paragliding equipment. Self-training greatly increases your chances of equipment and physical damage or death. Beware of purchasing used equipment, Do it Yourself kits, PPG Plans, or anything for sale on online auction sites at under market prices. REFUND POLICY: All sales are final & we do not refund prepaid equipment or services. A 3% credit card processing fee will be added to any Paramotor Package purchased without the presence of the purchaser. BlackHawk Paramotors USA Inc. offers the safest and most reliable equipment on the market. Learning on new reliable equipment will produce the best environment and circumstance for safe and successful training. BlackHawk Paramotors USA Inc. & Velocity Paragliders USA (a division of BlackHawk Paramotors USA Inc.) reserves the right to refuse sales and training to any individual which we deem unfit or unsafe to fly. BlackHawk Paramotors USA Inc. & Velocity Paragliders USA (a division of BlackHawk Paramotors USA Inc.) assumes no liability or responsibility for the proper assembly, use, maintenance, or performance of any equipment supplied by BlackHawk Paramotors USA Inc., its owners, dealers, or employees. This website, it's information, & our policies are subject to change, at any time, without prior notice.